Approx 5.5 x 4 inches (14 x 10 cms). In fine condition. 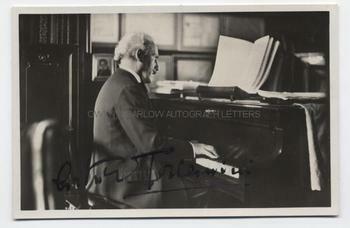 An attractive portrait, showing Toscanini seated at his piano. Although he began his career as a cellist, Arturo Toscanini went on to become one of the greatest conductors of all time. Amongst his many accomplishments can be counted the world premieres of several of the great operas, including La Boheme and Turendot. He also conducted the world premiere of Samuel Barber's most famous work, Adagio for Strings. He played an important role in modernising the performance of opera. Through his many recordings and his connections with some of the world's leading orchestras he became a household name and one of the best known musical personalities of his generation.